^ a b Ryczek, William. "Why the National Association Was a Major League". The National Pastime Museum. Retrieved 26 September 2017. ^ a b c d "MLB TO ELIMINATE TWO TEAMS". Wired. AP. 7 November 2001. Retrieved 26 September 2017. ^ "Louisville Colonels Team History & Encyclopedia". Baseball Reference. Retrieved 23 September 2017. ^ "Baltimore Orioles Team History & Encyclopedia". Baseball Reference. Retrieved 23 September 2017. ^ "Cleveland Spiders Team History & Encyclopedia". Baseball Reference. Retrieved 23 September 2017. ^ "Washington Senators Team History & Encyclopedia". Baseball Reference. Retrieved 23 September 2017. ^ Russell, Doug (2 March 2012). 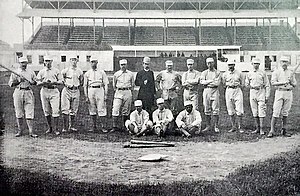 "Milwaukee's first Major League team remembered. No, not them". OnMilwaukee. Retrieved 27 September 2017. ^ a b "Baltimore Orioles Team History & Encyclopedia". Baseball Reference. Retrieved 23 September 2017. 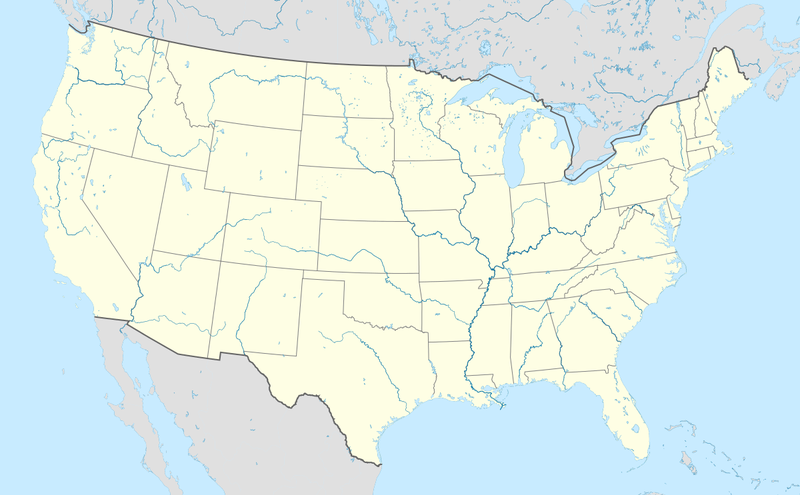 ^ This iteration of the Orioles is sometimes considered to be predecessor of the New York Yankees, but the Yankees themselves treat the Yankees as a separate franchise. Lynch, Mike. "1901-02 Orioles Removed from Yankees History". Sports Reference. Retrieved 26 September 2017. ^ Thorn, John. "The House That McGraw Built". Our Game. John Thorn. Retrieved 26 September 2017. ^ Spatz, Lyle (2012). Historical Dictionary of Baseball. Scarecrow Press. p. 161. ^ a b "Newark Peppers Team History & Encyclopedia". Baseball Reference. Retrieved 23 September 2017. ^ "Kansas City Packers Team History & Encyclopedia". Baseball Reference. Retrieved 23 September 2017. ^ "Chicago Whales Team History & Encyclopedia". Baseball Reference. Retrieved 23 September 2017. ^ "Baltimore Terrapins Team History & Encyclopedia". Baseball Reference. Retrieved 23 September 2017. ^ "St. Louis Terriers Team History & Encyclopedia". Baseball Reference. Retrieved 23 September 2017. ^ "Brooklyn Tip-Tops Team History & Encyclopedia". Baseball Reference. Retrieved 23 September 2017. ^ "Pittsburgh Rebels Team History & Encyclopedia". Baseball Reference. Retrieved 23 September 2017. ^ "Buffalo Bisons Team History & Encyclopedia". Baseball Reference. Retrieved 23 September 2017. ^ Emery, Tom (31 March 2016). 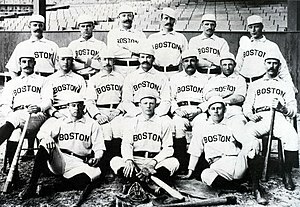 "When the Braves called Boston home". Providence Journal. Retrieved 27 September 2017. ^ a b "Atlanta Braves Team History & Encyclopedia". Baseball Reference. Retrieved 23 September 2017. ^ Jones, Landon (10 December 2014). "How Bill Veeck Invented the Baltimore Orioles". The Huffington Post. Retrieved 27 September 2017. ^ Warrington, Robert D. "Departure Without Dignity: The Athletics Leave Philadelphia". Society for American Baseball Research. Retrieved 27 September 2017. ^ a b "Philadelphia Athletics Team History & Encyclopedia". Baseball Reference. Retrieved 23 September 2017. ^ Goldman, Steven. "What the hell are the Giants doing in San Francisco, anyway?". SBNation. Retrieved 27 September 2017. ^ "San Francisco Giants Team History & Encyclopedia". Baseball Reference. Retrieved 23 September 2017. ^ Hirsch, Paul. "Walter O'Malley Was Right". Society for American Baseball Research. Retrieved 27 September 2017. ^ "Los Angeles Dodgers Team History & Encyclopedia". Baseball Reference. Retrieved 23 September 2017. ^ Hennessy, Kevin. "Calvin Griffith: The Ups and Downs of the last Family-Owned Baseball Team". Society for American Baseball Research. Retrieved 27 September 2017. ^ "Minnesota Twins Team History & Encyclopedia". Baseball Reference. Retrieved 23 September 2017. ^ Hylon, J. Gordon. "Why Milwaukee Lost the Braves: Perspectives on Law and Culture From a Half-Century Later". Marquette University Law School. Retrieved 27 September 2017. ^ Rieper, Max (20 January 2016). "Losing a sports team: The relocation of the Kansas City Athletics". SBNation. Retrieved 27 September 2017. ^ Caple, Jim (24 August 2016). "Seattle Pilots barely remembered, except through Brewers, 'Ball Four'". ESPN. Retrieved 27 September 2017. ^ "Milwaukee Brewers Team History & Encyclopedia". Baseball Reference. Retrieved 23 September 2017. ^ Eisen, Jeffrey M. (1987). "Franchise Relocation in Major League Baseball". University of Miami Entertainment & Sports Law Review. 4 (19). Retrieved 27 September 2017. ^ "Texas Rangers Team History & Encyclopedia". Baseball Reference. Retrieved 23 September 2017. ^ Panetta, Alexander (13 September 2014). "Twenty years after historic season cancelled, the 'Montreal Expos' back in first". The Globe and Mail. Retrieved 27 September 2017. ^ "Washington Nationals Team History & Encyclopedia". Baseball Reference. Retrieved 23 September 2017. ^ Thorn, John (4 May 2015). "Why Is the National Association Not a Major League … and Other Records Issues". MLB.com. Retrieved 28 September 2017. ^ a b The Hartford Dark Blues moved to Brooklyn for the 1877 season, becoming the Brooklyn Hartfords. This page was last edited on 25 February 2019, at 00:06 (UTC).